I really love the "Big Bad Wah" (a.k.a "BB" wah). It's the best wah pedal that I've ever owned. It sounds great and versatile. It's lightweight, just about the half weight of Crybaby wah pedal. 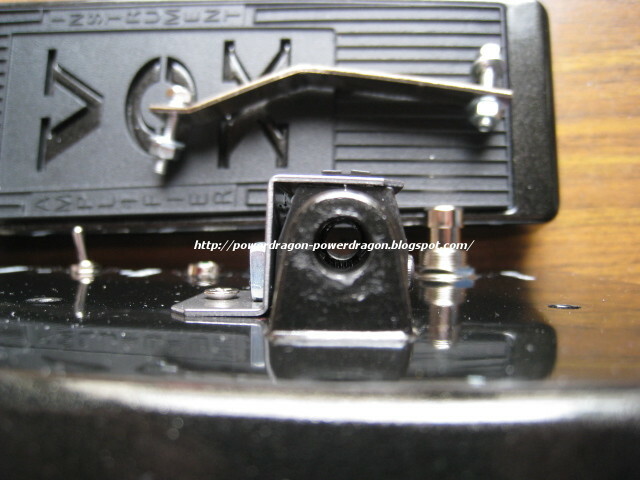 The only problem is the expression pedal will become loose and won't hold on certain position. it won't hold there tight as Dunlop Crybaby wah pedal. Therefore, I modified my Vox "Big Bad Wah" with "adjustable torque clutch" from Dunlop Crybaby. Access to the inside of wah pedal and loosen the two screws which hold the metal strap. Hammer out the original knurl pin by using another old knurl pin. Use pliers to pull out the whole knurl pin from the other side. "Big Bad Wah" pedal was separated. Replaced the traditional metal strap by the "adjustable torque clutch". Need to drilled a little hole on the chassis for the screw of torsion block bracket. "Adjustable Torque Clutch" was properly set. Compare the traditional metal strap with "adjustable torque clutch" from Dunlop Crybaby. Now I can adjust the expression pedal tension of my Vox "Big Bad Wah" easily as much as Dunlop Crybaby.